While most college-bound students have heard of the SAT and the ACT tests, many are unsure of what the SAT Subject Tests are, who should take them, and when they should be taken. One thing that needs to be made clear is that not everyone needs to take these tests. In general, some of the higher level colleges will require, recommend, or consider them. While the latter two are optional, there are a few colleges that require two or three subject tests for general admission consideration or for specific majors. For example, Harvey Mudd College in Claremont, California, requires the SAT or the ACT and “two SAT Subject Tests. One must be in Math Level 2; the other can be in any subject the student chooses.” In general, if a college says “recommended,” it’s probably best to take the SAT Subject Tests as well, especially in the subjects that you are interested in pursuing in college. Last July, Prep Scholar created a comprehensive list of approximately 80 colleges that have indicated some policy on SAT Subject Tests. However, while you are in the process of researching colleges, it is best to find out the admission requirements directly from each school’s website. Since policies can change from year to year, going directly to the source is the best way to ensure that your information is up to date. So What are the SAT Subject Tests? The College Board offers 20 additional content-specific tests in five areas: math, science, English, history, and languages. These hour-long tests are offered on the same day as the regular SAT; however, you cannot take both the SAT and the SAT Subject Tests on the same day. Instead, you can take either the SAT or up to three SAT Subject Tests on any of the SAT testing days, except for March, when the Subject Tests are not offered. So, anyone can take these classes; however, keep in mind that most colleges do not require or even recommend taking SAT Subject Tests. While you can take these tests whenever they are offered, it is best to take them after you have learned the material in a high school class. Typically, the best time to take these tests is in May or June of the school year in which you took the class. Therefore, if you took AP Biology during your freshman year, you should take the Biology Subject Test in May or June of freshman year. Realistically, if you studied biology in freshman year and then wait until your junior year of high school to take the Biology Subject Test, it might be difficult to do well since these tests are very content specific. If you took a course that coincides with a subject test, but you weren't able to schedule that test right after the school year, it's best to take time over the summer to review the material again as a refresher. Take a practice test or two, and sit for the August SAT Subject Test. 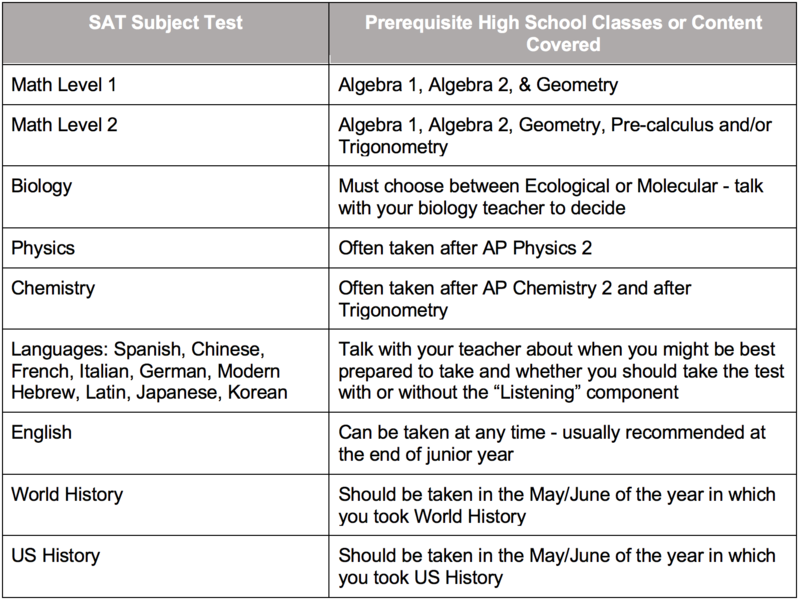 Below is a chart that explains the suggested prerequisites and/or content for some of the tests. If you are unsure of when to take a specific test, don’t be afraid to talk with your teacher or your guidance counselor to get some advice. Each Subject Test is scored out of 800 points and scaled differently. As a result, look at the approximate number of questions that you need to answer correctly in order to earn the score that you desire on a particular test. For example, while Math Level 1 might be a bit of an easier test, since it doesn’t cover concepts tested in Trig or Pre-calc, the scale tends to be more difficult. A student might need to answer every question correctly in order to achieve an 800. Meanwhile, the Math Level 2 might test more difficult concepts, but the scaling tends to be easier. In fact, a student might be able to skip up to six or seven questions and still score a perfect 800. Since students are still penalized ¼ of a point for each incorrect answer on the SAT Subject Tests, it is a good idea to understand how many questions can be skipped to achieve the score that you desire. These scales, along with the answer keys, can be found at the back of practice tests. The College Board publishes The Official Study Guide for All Subject Tests, which contains at least one practice test for each type of subject test. In this book, you can the take practice tests, score them, and figure out the scaling for the different tests. What if I Haven’t Taken Subject Tests & I just Realized That I Should Have? Let's say you fall in love with a college while researching and visiting schools during the end of your junior year or the summer before senior year. That's great! But what if said college requires or recommends Subject Tests and you haven't taken any? What do you do?? Try not to panic. Remember, the Subject Tests are only one of the many factors used when deciding your admission. If you look carefully at Prep Scholar’s list of colleges, very few of them require Subject Tests for admission. So, while some may recommend them, you can still apply without Subject Tests. 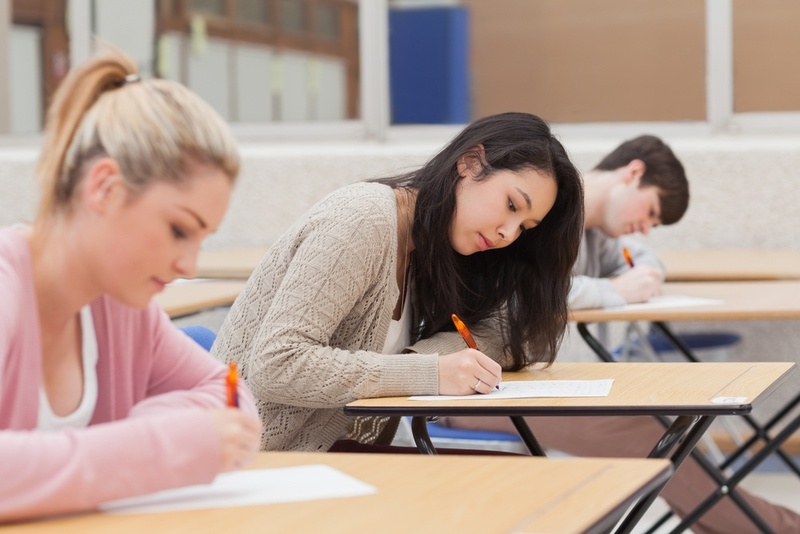 However, if you still feel the pressure to take them, the two Subject Tests that can be taken at any time are the Math and English tests, since they cover content that you should have learned over your years in high school rather than course-specific content, such as US History or Physics. If the colleges to which you are applying do not have Subject Test requirements, there is no reason to spend the time or money on taking these tests. The vast majority of colleges do NOT even consider them as part of the admission process. Admission policies for colleges vary greatly and change often, so it is best to research or contact each college for its current application requirements. However, if you are going to take these tests, remember that you cannot take the regular SAT test on the same date, so plan your June, July, and August testing accordingly.